It was 1854 when Samuel Rees Pritchard built the Greek Revival house on the farm that had been in his family since 1756 and called it "Brightside". This was to become home for his future wife and family. In 1858 Samuel married Helen Johnson, daughter of a wealthy New Jersey family, and brought her to Kernstown to start a new life. Samuel, a fourth generation Pritchard to live on this land, was a very prosperous farmer with 206 acres of land in production. He was also a wheelwright supplying wheels for the wagon builders in Newtown a few miles up the road (now Stephens City), and he had a lucrative hauling business which carried freight up and down the east coast from Tennessee to New Jersey. Life was very good for Helen and Samuel, and they quickly had three children. But suddenly life in the Shenandoah Valley was changing. Winds of secession were brewing in Virginia and the other Southern states. Samuel just wanted to stay out of it. He wanted to be left alone to pursue his way of life and to build upon his successes. As if to say...leave me out of this... he did not vote in the 1860 presidential election, nor did he vote that year in the local election for a representative to the Virginia Secession Convention. But then the great struggle began and the war between North and South took on a life of its own. Everyone was involved one way or another and the once peaceful Shenandoah Valley turned bloody and brutal. For Samuel and Helen, it became very personal on March 23, 1862, when their quiet farm was overrun with troops, both Northern and Southern. Sixteen Union cannon were in place atop Pritchard's Hill just behind their home. Confederate troops were advancing from the south across their farmland toward the hill. Cannon fire roared in a constant rumble slicing through the Confederate ranks, and the sharp report of musket fire cut through the valley felling men in those once peaceful fields. Suddenly the Southern ranks were turned sharply westward and headed for the relative safety of nearby Sandy Ridge. Through all of this turmoil Helen (pregnant with her fourth child), Samuel and their three children, huddled together in their cellar waiting for the end of the battle...hoping for the best but fearing the worst. By nightfall all was quiet again. The Southern men, having run out of ammunition, had been routed...Union forces were in control. The next day townspeople came to collect survivors and to bury the dead. Many wounded were brought to the Pritchard home where they were nursed and given care and comfort by both Helen and Samuel. This was to be the case throughout the years of the conflict. Over and over, wounded soldiers were brought to the Pritchards for care. Time and again, as the armies crossed back and forth across their land, countless wounded and dying men and boys in both blue and gray were cared for by Helen and Samuel. In the summer of 1863 just prior to the Second Battle of Winchester, Union artillery again was placed on Pritchard's Hill in an effort to keep the Confederate army at bay. Luckily for the Pritchards, the next day that battle moved on to Winchester and they sighed in relief. But by the next summer, on July 24, 1864, the stage had been reset and the players were again in place for the Second Battle of Kernstown. On that day Union artillery, in a commanding position atop Pritchard's Hill, was firing at the Confederate army facing them. Swarming over the Pritchard farm and in the nearby vicinity were over 12,000 Union forces and almost 17,000 Confederates, who were countering their attack. The once tranquil Pritchard farm had once more become a raging, roaring, bleeding battleground between two opposing forces. Again Helen and Samuel with their children took refuge in the cellar. Again, they waited for the battle to end and for calm to return. This time it was the Northern men who were routed from the field. Once more, the Pritchard home became a hospital with the wounded and dying brought in for nursing care and comfort. Three days after the battle, Col. James A. Mulligan, commander of the Union Army 2nd Division, died of his wounds in Samuel's arms. 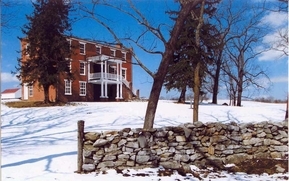 Later that year, after the terrible destruction of the Valley resulting from Sheridan's Valley Campaign, the Pritchards' home was utilized as a headquarters by Sheridan's cavalry chief, Gen. Albert Torbert, while the Pritchard farm and countless other farms in the valley for miles around were turned into a massive Union camp. What resources remained on these farms were largely demolished and utilized in the camp to build huts for the soldiers. Two months after they came, the Union army moved the camp fifteen miles north leaving the once prosperous farms and families of the Lower Shenandoah Valley in shambles. The Pritchards were now penniless. The war was over a few months later. In the years that followed Samuel and Helen worked to rebuild their farm and business but the times were difficult for everyone in the South. Their child born after the First battle had died two years later and one more child had been born after the war. Samuel and Helen had four remaining children. Ten years passed during which time Samuel began a whiskey distilling business with L.E. Savage. In 1875 the individual who held the Pritchard home mortgage and other loans died and his family called the loans. In desperation, Samuel, unable to generate enough cash to pay off the loans, filed a claim for restitution with the Southern Claims Commission for loss of property suffered at the hands of the Union army. His claim amounted to $5,694.45. Claimants were required to prove that they were not Confederate sympathizers and when the Commission eventually held hearings it found against Samuel stating that Pritchard had been "disloyal to the Union." Samuel never heard the ruling as he had died soon after filing the claim. 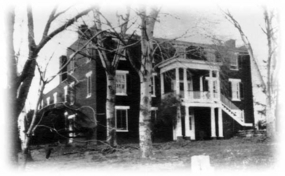 After Samuel's death, the farm was sold to his brother-in-law, John M. Miller, and his wife Elizabeth (Betty) Pritchard Miller. Helen moved with her four children into a small house on Cork Street in Winchester where she remained until her death in 1881. 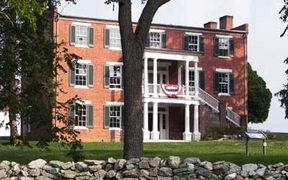 In 1879 Col. James H. Burton bought the 205 acre Pritchard farm from Miller. Burton was highly respected and very well-known in the arms industry. Besides his work at the U.S. Armory at Harpers Ferry and at the Springfield Armory in Chicopee, Mass., he was Chief Engineer of the Royal Small Arms Factory at Enfield, England. He returned to Virginia in 1860 and was commissioned to reactivate the Tredegar Armory in Richmond. When the Civil War began he was commissioned Lt. Col. of Ordnance and ultimately was appointed Superintendent of Armories for the Confederacy. In 1862 he opened an armory at Macon, Georgia for the manufacture of arms, powder, ammunition and all ordnance stores, and he remained there until the end of hostilities. After the war years Burton returned to England with his family until illness forced his returned to Virginia in 1868. Later he was contracted by the Czarist Russian government to establish an armory in Tula, Russia. He returned to Europe where he designed much of the equipment for that enterprise but illness forced his return to Virginia. Soon afterward he purchased the Pritchard Farm and delved into farming. Burton and his third wife Eugenia had seven living children when they moved into "Brightside", two others having died in infancy. Their tenth and last child was born in the house. (Burton had seven other children by his first two wives who had died.) Col. Burton became very prominent in the community and was said to be the "smartest man who ever lived in Winchester." Sadly, after only eleven years on the farm, illness again demanded that the colonel retire to a less stressful lifestyle. The farm was sold and the Burton family moved to Winchester. In 1890 Col. Burton sold the farm to Charles Henry Grim, a farmer and former contractor and builder. Charles Henry and his wife, Hattie, had two children, Charles Hardy and Edmonia. In 1923 their son, Charles Hardy Grim I inherited the farm. He and his wife, Etha, had one son, Charles Hardy Grim II. In 1931 Grim II inherited the farm upon the death of his father who had been instantly killed by a bolt of lightning while loading a wagon with hay. Charles Hardy II married Emily Grove in 1958. They had no children. The farm prospered under his management and included many acres of fruit orchards, a beef cattle operation, and fields brimming with grain and hay. After the death of Charles Hardy's mother Etha in 1945, the old Pritchard House was never again occupied. The couple both wanted to live in the house but it was over 100 years old and required updating and renovation. Since they couldn't agree on how it should be done, they chose to live in the home in Winchester which Charles Hardy had inherited from his aunt Edmonia. He continued to farm the land until his death in 1989 and by the terms of his will the farm was placed in a trust. The Kernstown Battlefield Association invites you to visit!